Hey foodies! The Yorkville Food Truck Rally 2019 is back and better than ever! 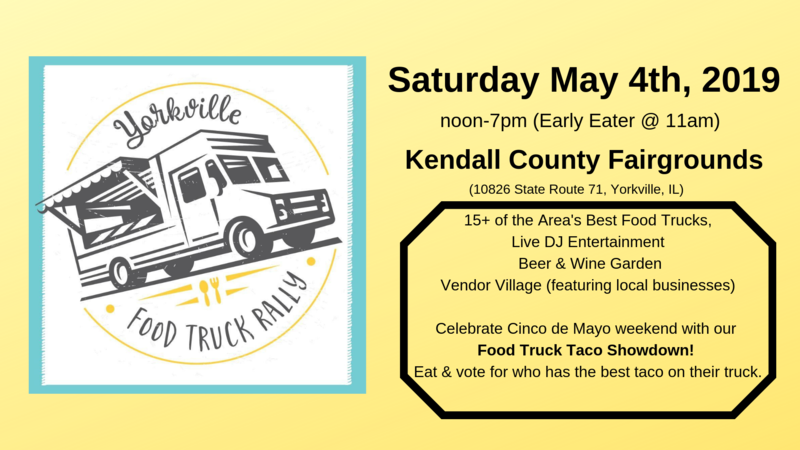 Featuring over 15 of the area's best food trucks, live DJ Entertainment, a beer & wine garden and the Vendor Village (featuring local businesses) - it's fun for the whole family. In addition, to celebrate the Cinco de Mayo weekend - we will be bringing back our popular Food Truck Taco Showdown! Several trucks will be featuring tacos on their menu - who will have the best one - you decide! Just eat, and vote on our online FB page poll to help us pick a winner. 2019 Food Truck Lineup (more to be added soon) T= taco on menu ~The Happy Lobster Truck (Lobster Rolls) ~Grumpy Gaucho (Empanadas) ~Kona Ice (Shaved ice Creations) ~My Funnel (Funnel Cakes & Ice Cream) ~Burritoville (Mexican Cuisine) - T ~Fat Tomato INC (Tacos/Nachos) -T ~Nothing Bundt Cake (Bundtlet Cakes) ~SausageFest Truck (Sausages - Polish, German & Hot Dogs) ~Bricks on Wheels (Pizza's) -T #tacopizza ~Wok N' Roll by Bamboo (SE Asian Noodle Dishes & Small Plates) ~Three Legged Tacos (Tacos, Salads & Sides) -T ~Ding Ding Chicken Wing (Wings & Sauces) ~Da Portable Rican (Puerto Rican/Caribbean Cuisine) ~Rogue Farm to Curbside Kitchen (American Fare) -T ~ALMA Food Truck (Latin American Cuisine) Vendors (2019 Lineup TBA soon) (All participants are subject to change) Interested in being a vendor? Send us an email to info@brewavenueevents.com for an application. Want first crack at your favorite food trucks? We are offering an Early Eater Pass ($6 online or $8 at the door). Join us from 11am-12pm for exclusive access to the grounds & the trucks before the General Admission session begins @ noon. General Admission into the fairgrounds will be $4 online and $6 at the door. Kids 10 & under are free with a paying adult. May the 4th be with you! Dress up in your favorite Star Wars outfit and enjoy free admission starting at noon! Additional Information: Ample free parking will be available on site! Food & drink will be sold separately from admission This event is family friendly Cash & Credit available at gate and most vendors Eat for a cause! A portion of the proceeds will benefit the Kendall County Fairgrounds Association, a non-profit 501(c)(3) organization. Visit our FB event page (facebook.com/events/511725542641185/) where we will post event news, participating trucks bio's and host giveaways. Feel free to bring lawn chairs & blankets! Please leave pets at home. Yorkville Food Truck Rally is a Brew Avenue Events production.